The Sudanese armed forces are not “against the demands” of protesters seeking the departure of long-serving President Omar al-Bashir, the country’s defence minister has said, warning, however, that the army will not allow a “fall into chaos”. Over the past four months, Sudan has witnessed widespread anti-government protests that were sparked by anger over rising bread prices but quickly morphed into broader calls against al-Bashir’s three-decade rule. “Sudan’s armed forces understand the reasons for the demonstrations and … aspirations of the citizens,” General Awad Ibnouf said on Monday at a meeting of top military brass, according to the state-run SUNA news agency. The defence minister’s statement came after activists said that soldiers in the capital, Khartoum, have intervened in recent days to shield protesters amid a deadly crackdown by security agents loyal to the 75-year-old al-Bashir. Protest organisers say forces belonging to the widely-feared National Intelligence and Security Service (NISS) have used tear gas, rubber bullets and live ammunition in a bid to disperse thousands of demonstrators who have camped out since Saturday in front of the army headquarters, which also houses al-Bashir’s residence. “In the last 72 hours, there has been a positive [development], to some extent, … that army officers are supporting protesters and protecting them from the National Intelligence and Security Service,” SPA spokeswoman Sara Abdeljaleel told Al Jazeera from Britain’s capital, London. “We keep asking for the army to … protect this revolution and keep it peaceful,” she added. 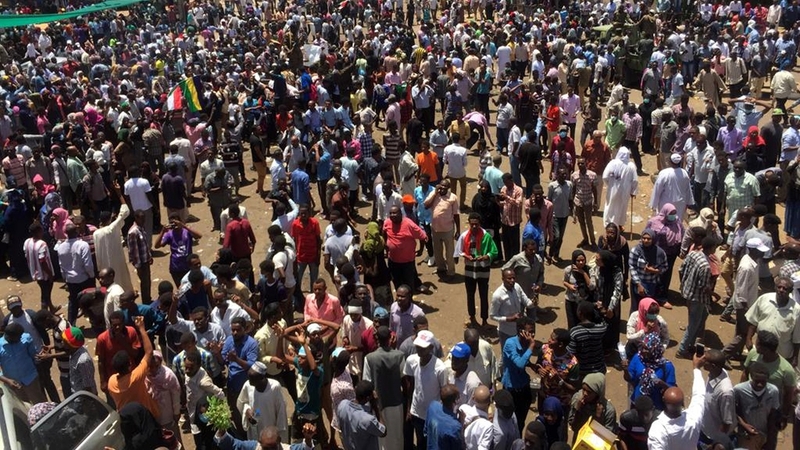 As crowds in Khartoum shouted slogans such as “Sudan is rising, the army is rising” to encourage the armed forces to back their demands, the protesting Alliance for Freedom and Change group sought direct talks with the army forming a transitional government. “We reiterate our people’s demand that the head of the regime and his government have to immediately step down,” Omar el-Digeir, a senior member of the group, said in a statement outside the army headquarters. “We also call on the Sudanese armed forces to withdraw their support for a regime that has lost its legitimacy,” Digei added. Analysts, meanwhile, said senior military figures were keen to “find a way” for Bashir, whose power base is within the armed forces, to step down “gracefully” and initiate a transition of power. “The army would like to come out of this as the people who saved Sudan from chaos,” said Alex de Waal, an expert on Sudan, told Al Jazeera. “What we see on the streets in the moment is a clear division between some in the army and some in the NISS … which is overplaying its hand,” added de Wall, a research professor and executive director of the World Peace Foundation at the US-based Tufts University. De Waal also said “enormous effort” was being made by military leaders to “keep the army together” over fears any internal fractures in responding to the anti-government protests could raise the prospect of a full-blown civil war. In an address to the Sudanese parliament on Monday, Interior Minister Bushara Juma said seven people were killed and 2,496 arrested during demonstrations in Khartoum and other cities over the weekend. The latest deaths take the overall toll to 38, according to officials. Human Rights Watch says more than 50 people have been killed, including children and medics, since the beginning of the protests in December. In response to the nationwide anti-government demonstrations, al-Bashir in late February imposed a state of emergency which led to the protests largely being confined to Khartoum and Omdurman, the capital’s twin city. 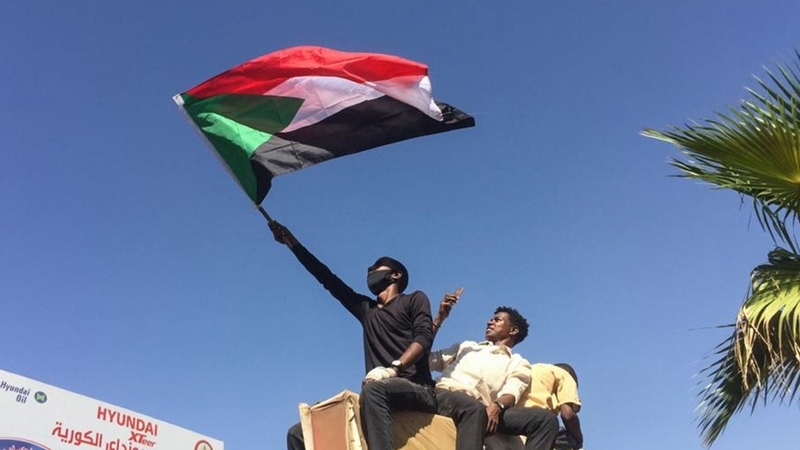 But the recent resurgence of the protests, coupled with the possible fractures within the security structure, signalled that Sudan was heading towards an imminent “crunch” point, analysts said. “Either the military will have to side with the regime and aide and abet the crackdown … or they will have to take a stand and at least ask for the president to resign in the same way as has happened in Algeria,” Abdelwahab el-Affendi, a professor of politics at the Qatar-based Doha Institute, told Al Jazeera. Last week, Abdelaziz Bouteflika resigned as Algeria’s president after weeks of mass protests demanding the end of his 20-year tenure. Al-Bashir has so far refused to step down, and has instead overseen a crackdown on critics accusing him of mismanaging the economy, leading to soaring food prices, regular fuel shortages and widespread cash shortages. The president, who took power in a 1989 coup, has acknowledged that the economic concerns raised by protesters are “legitimate” but says his opponents should seek power through the ballot box when his term ends in 2020.